Banville is good at this sort of thing. Church, bicycle, pearly knickers – he makes us feel, forcibly, how a boy’s life can be shaped by the fortuitous convergence of these disparate things. Was this vision of loveliness Mrs Gray herself, wonders the ageing Cleave, or only ‘an annunciation of her’? Cleave is trying to make sense of his memories because he has yet to make sense of his life. His only child, Cass, has killed herself. His wife suffers ‘nocturnal bouts of mania,’’dashing in the dark through all the rooms … calling out our daughter’s name.’ Cleave’s stage career has left him bewildered; has he ever been more than a prop, manipulated to suit his director’s needs? Was this pattern set when, aged fifteen, he found himself the object of Mrs Gray’s designs and desires? Now – improbably, it must be said – Hollywood has come knocking for the first time. Cleave is to play the part of Axel Vander (an approximate anagram of Alexander Cleave), a deconstructionist literary critic. Why anyone would agree to fund a motion picture about one of those is a question not adequately addressed. The film is to be called The Invention of the Past, a none-too-subtle clue as to the nature of Cleave’s attic scribblings, with a knowing wink at Banville’s own role as novelist – the inventor of the invention of … and so on. This part of the book is tedious. There’s a silent, sphynx-like figure called Billie who extracts people’s secrets, a beautiful damaged co-star, Dawn Devonport, who is more or less abducted by Cleave, and a mysterious Argentinian who reveals the meaning of the universe to Cleave in a hotel bar. ‘The gods watch over us, and are jealous,’ he intones, as if he’s strayed out of something by Carlos Castaneda. None of these characters feel at all real. I suspect that may be the point. Long- ago Mrs Gray on the stained and lumpy mattress in the derelict cottage the unlikely lovers use as a rendezvous, ‘her breasts in their white halter huddling fatly against each other’ – the young Alex Cleave’s passion for her feels achingly real. The world of memory, where everything is pregnant with meaning, wins hands down over the stilted, schematic present. But where does the truth lie? Cleave and his dead daughter have appeared in other novels by Banville, but reading Ancient Light left me too enervated to seek them out. Half of this book pulls you right in, the other half throws you out. Banville’s turns of phrase can be dazzling, but his mind games leave me cold. 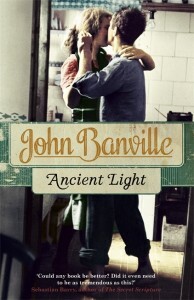 Is the seductive Banville becoming too clever and seduced by his own charm?